As the first defense line against the surrounding environment, the cable jacket prevents the core of fiber optic cable from water, flame, chemistry, etc. Meanwhile, the outermost layer keeps inert to gases and liquids that may be exposed during its service life. Besides, the cable jacket provides a smooth, low friction surface. The jacket must be made of a material that can keep the cable flexibility and maintainability at all temperatures during its service life. Today our topic is the cable jacket rating of fiber optic cable. The optical fiber cable is composed of the inner core, cladding, coating, strength member and the outer cable jacket. The core made of plastic or glass is a physical medium used for optical signal transmission. Because bare fibers are easily broken, outer cable jacket is required to protect optical fibers. Just like mentioned above, the cable jacket is the first line of moisture, mechanical, flame and chemical protection for cables. 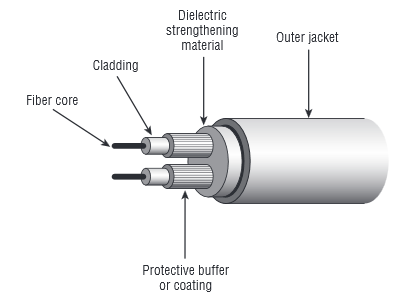 If there is no jacket, fiber optic cable is likely to be damaged during and after installation. Common jacket materials are PE (Polyethylene), PVC (Polyvinyl Chloride) and LSZH (Low Smoke Zero Halogen). In general, the NEC (National Electrical Code) provides eight grades of fire resistance for non-conductive and conductive cables. All indoor cables must be marked and installed for the intended purpose: plenums, risers, and general purpose areas. Plenums: A plenum area is is used for air flow or air distribution system (ceiling and elevated floor) building space. Risers: A riser area is a floor opening, shaft or pipe vertically passing through one or more floors. General purpose areas: The general area refers to all other areas on the same floor without pressure ventilation systems or risers. Cable jacket rating is important. If the cables do not have these ratings, they cannot be installed on walls or ceilings. Here we will introduce the most common cable jacket ratings that you will encounter. CL/CM/CMG: These cable jackets are applicable to all common situations. Specifically, CL cables are used for audio and video applications, and CM/CMG for communication applications, such as Ethernet. They are all tested through the so-called “vertical tray flame test”, which means they usually won’t spread the flame more than eight feet. You can install these rated cables on walls or ceilings without worrying about risers and plenums at home. CMR: The CMR rating means that the cables can be used in the risers of commercial buildings because they limit flame spread better than the cables in the CL/CM series. In addition to plenums, they can be installed anywhere. CMP: “P” clearly represents the plenum, so in addition to the places where CM and CMR cables can operate, this communication cable can also be used for plenums. The jacket is made of the material that retards the spread of flame. It does not emit a large amount of smoke or poisonous gas when it burns. These are the common ratings of fiber optic cable jacket. We should follow these cable jacket ratings in the NEC guidelines to minimize the risk of impact, fire and toxic smoke in each area, thus preventing fire. Besides, fiber optic cable plays an important role in the field of communication. You can visit www.fs.com to find fiber cables that can meet your needs, such as single mode fiber optic cable, multimode fiber optic cable, and fiber patch cord. I hope you can get your own cable. This entry was posted in Bulk Fiber Cables and tagged cable jacket, fiber cable, fiber patch cord, single mode fiber optic cable on August 29, 2018 by Admin. As late as 1993, it seemed that in order to move toward the future of desktop computing, businesses would have to install fiber optic cabling directly to the desktop. It’s surprising that copper cable (UTP) performance continues to be better than expected. Fiber versus Fibre: Are these the same? Yes, just as color (U.S. spelling) and colour(British spelling) are the same. Your U.S. English spell checker will probably question your use of fibre, however. Transmission distances are much greater than with copper cable. Bandwidth is dramatically higher than with copper. Fiber optic is not susceptible to outside EMI or crosstalk interference, nor does it generate EMI or crosstalk. Fiber optic cable is much more secure than copper cable because it is extremely difficult to monitor, eavesdrop on, or tap a fiber cable. NOTE: Fiber optic cable can easily handle data at speeds above 10Gbps; in fact, it has been demonstrated to handle data rates exceeding 500Gbps! Since the late 1980s, LAN solutions have used fiber optic cable in some capacity. Recently, a number of ingenious solutions that allow voice, data, and video to use the same fiber optic cable have emerged. Fiber optic cable uses a strand of glass or plastic to transmit data signals using light; the data is carried in light pulses. Unlike the transmission techniques used by its copper cousins, optical fibers are not electrical in nature. Plastic-core cable is easier to install than traditional glass core, but plastic cannot carry data as far as glass. In addition, graded-index Plastic Optical Fiber (POF) has yet to make a widespread appearance on the market, and the cost-to-bandwidth value proposition for POF is poor and may doom it to obscurity. Light is transmitted through a fiber optic cable by Light-Emitting Diodes (LEDs) or lasers. With newer LAN equipment designed to operate over longer distances, such as with 1000Base-LX, lasers are commonly being used. A fiber optic cable consists of a jacket (sheath), protective material, and the optical-fiber portion of the cable. 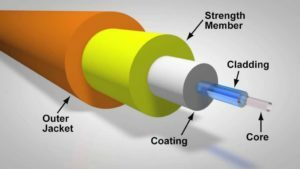 The optical fiber consists of a core (8.3, 50, or 62.5 microns in diameter, depending on the type) that is smaller than a human hair, which is surrounded by a cladding. The cladding (typically 125 micrometers in diameter) is surrounded by a coating, buffering material, and, finally, a jacket. The cladding provides a lower refractive index to cause reflection within the core so that light waves can be transmitted through the fiber. Two varieties of fiber optic cable are commonly used in LANs and WANs today: single-mode and multimode. The mode can be thought of as bundles of light rays entering the fiber; these light rays enter at certain angles. No, dark fiber is not a special, new type of fiber cable. When telecommunications companies and private businesses run fiber optic cable, they never run the exact number of strands of fiber they need. That would be foolish. Instead, they run two or three times the amount of fiber they require. The spare strands of fiber are often called dark fiber because they are not then in use, that is, they don’t have light passing through them. Telecommunications companies often lease out these extra strands to other companies. Single-mode fiber optic cable is most commonly used by telephone companies in trans-continental links and in data installations as backbone cable interconnecting buildings. Single-mode fiber optic cable is not used as horizontal cable to connect computers to hubs and is not often used as a cable to interconnect telecommunications rooms to the main equipment room. 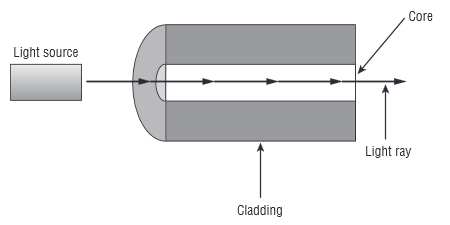 The light in a single-mode cable travels straight down the Single-Mode Fiber (MMF) and does not bounce off the surrounding cladding as it travels. Typical single-mode wavelengths are 1310 and 1550 nanometers. Before you install single-mode fiber optic cable, make sure the equipment you are using supports it. The equipment that uses single-mode fiber typically uses expensive lasers to transmit light through the cable because a laser is the only light source capable of inserting light into the very small (8- to 10-micron) core of a single-mode fiber. Multimode fiber optic cable is usually the fiber optic cable used with networking applications such as 10Base-FL, 100Base-F, FDDI, ATM, Gigabit Ethernet, and 10 Gigabit Ethernet that require fiber optics for both horizontal and backbone cable. Multimode cable allows more than one mode (a portion of the light pulse) of light to propagate through the cable. Typical wavelengths of light used in multimode cable are 850 and 1300 nanometers. There are two types of multimode fiber optic cable: step index or graded index. Step-index multimode fiber optic cable indicates that the refractive index between the core and the cladding is very distinctive. The graded-index fiber optic cable is the most common type of MultiMode Fiber (MMF). The core of a graded-index fiber contains many layers of glass; each has a lower index of refraction going outward from the core of the fiber. Both types of multimode fiber permit multiple modes of light to travel through the fiber simultaneously. Graded-index fiber is preferred because less light is lost as the signal travels around bends in the cable; therefore, the cable offers much greater bandwidth. The typical multimode fiber optic cable used for horizontal cabling consists of two strands of fiber (duplex); the core is either 50 or 62.5 microns (micrometers) in diameter, and the cladding is 125 microns in diameter (the measurement is often simply referred to as 50/125 micron or 62.5/125 micron). This entry was posted in Bulk Fiber Cables and tagged fiber optic cable, multimode fiber optic cable, single mode fiber optic cable on November 13, 2014 by Admin.